To get to the Lofoten Islands in the north of Norway, above the Arctic circle, you can take a boat, a train or fly. The boat can take upwards of a week as meanders through stunning fjords and rugged coastlines. The train isn’t much better time wise and you get stare at endless forests and lakes as you go through tunnel after tunnel. The final option is to fly, being based in Voss we hoped to fly from Bergen, only an hour by train. However, it turned out that train to Oslo and flight from there to Tromsø was the most economical and timely way to go. So after Yves finished work, we hurriedly packed clothes, tent, sleeping bags, pads, wavered on how to smuggle gin through customs (opted not to) and headed to the train station. The plan was a 6 hour odd train ride to Oslo, followed by a quick transfer (8 minutes between) to the airport train, crash in the airport and 8.25am flight in the morning. We hit a snag when an accident on the tracks forced us to be detoured by bus around that section, adding almost an hour. Of course this meant we missed our 8 minute window. Luckily, the conductor assured us there was another train precisely 9 minutes after our arrival heading to the airport. Great, no worries then. We got to the Oslo train station, checked the boards for the appropriate train (which was actually 11 minutes from then) and caught it with no problem, direct to the airport within 20 minutes. At the stop we hit our next snag, there was a barrier turn style requiring a special ticket to get through to the actual airport… looking fairly perplexed, we stood in line behind a gentleman who was paying copious amounts of Kroner (6.20K = $1, give or take) and ultimately was let through the gate. The delightful lady behind the glass explained our error, we had taken the express train, which was about triple what the local train was we had tickets for. In our horror and fear at blowing our budget before we even reached the actual airport we explained our situation. Luckily, this lovely lady, tsk’ed tsk’ed the conductor for giving us the wrong information and assured us we would not have to pay for his mistake, letting us through. It was only later we realised that the train he had mentioned must have in fact been the local train and we had taken the wrong train assuming the board with OSLO AIRPORT was the correct train, how silly of us. The local train simply says city center and apparently the airport is a stop on the way, or something like that. Important Traveler Information: When buying train tickets in Norway be double sure which train you are getting on. There are the public trains, much cheaper, and then private companies that offer the express trains. If you get on the wrong one the conductor will make you pay again. When in doubt ask someone, better safe than out of pocket. 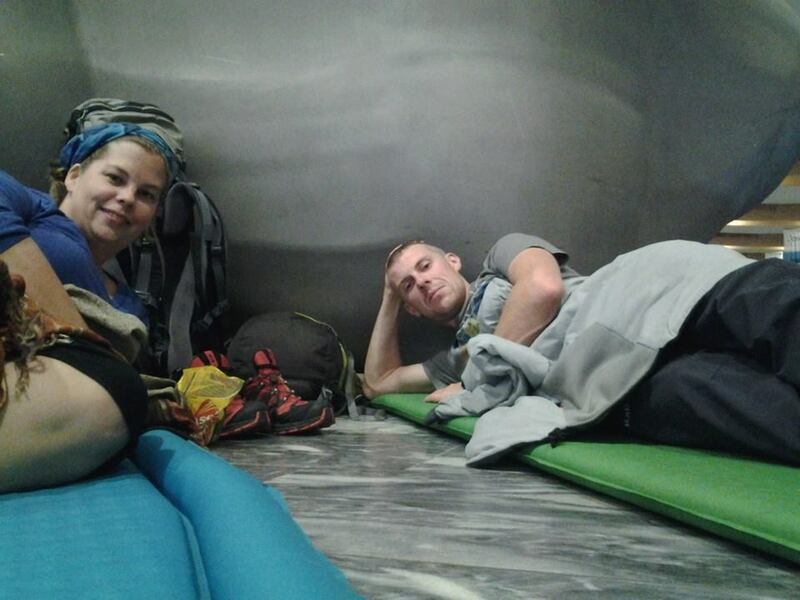 The clock was already passed midnight when we stumbled up the elevator and looked around for the most “comfortable” place to sleep. There were already a large number of airport campers scattered around, meaning most the chairs were taken. We opted to take a spot behind a particularly obscure statue, with a high potential of being phallic in nature. We rolled out our mats, me getting to get my first view at my new REI rails pad, super exciting. Lay down and within around 10minutes Yves was off in La-la land. Yours truly, on the other hand, snuggled down, marveling at just how well this new REI rails pad truly prevented any hip to floor contact, and the general cushy nature of it, closed my eyes, took a deep breath…and…BAM Eyes Wide Open! I am not talking, sleepy and not able to sleep, I am mean my brain was on full overload, as if it was attempting to solve a highly complicated calculus equation (and usually it can barely spell that). All through this, Yves was dreaming of hiking Everest and other great adventures, waking up briefly, seeing me awake, asking if I had got any sleep and then turning over and getting another 4o winks. At one point he mentioned how a pillow would make this whole experience so much better, he promptly received mine in his face, he gladly tucked it under and went back to sleep. Nearing the wake up hour I had managed to convince 3 of my 4 personalities to crave sleep, but that 4th one, man he was contemplating if penguins had knees or some other highly important theological topic. Finally we were able to check in. This was a new procedure for me, as you can now, apparently, print out your own baggage labels, and check your own bag, unless of course the bag check machine decides your bag is too big. It was apparently fine after standing in line for 15 minutes. Through security, me reaching zombie status and mumbling something about the need for coffee. I never realised my dependence on it until this trip, mornings just don’t seem complete without a cup of ‘jo. Stumbling after Yves towards our gate, which was at the very very very end of some random arm of the airport that seemed to go on forever, we waited for our flight. Thankfully it wasn’t full and I oozed into three seats, buckled myself into the middle and toppled over side ways gaining a precious hour of sleep, airplane style. Today we jumped on the Magic Bus and headed back to Auckland. 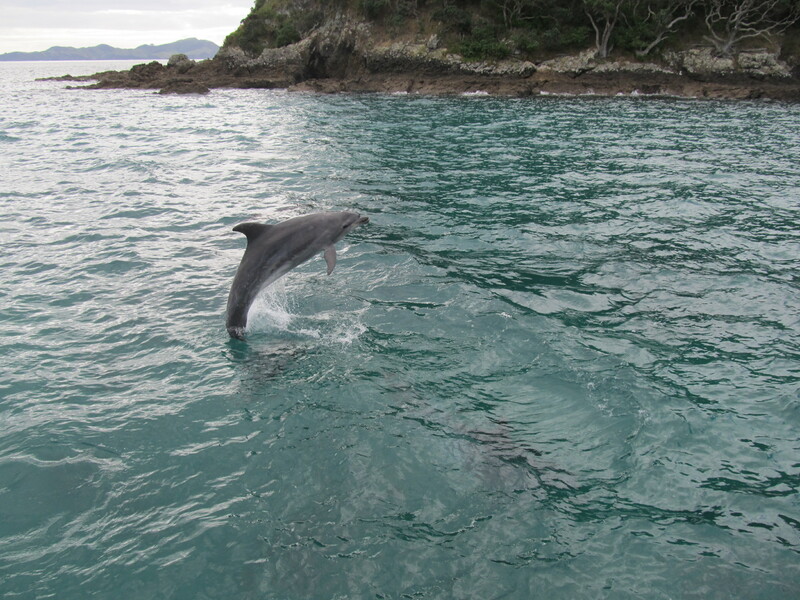 We stopped in at the info center of Hokianga Harbour hoping to watch a short video on Opo the gay dolphin…in terms of his happy temperament which I am sure is what all of you were thinking. But alas the video machine was glitching so we had to settle with skipping rocks across the bay. After a brief breakfast stop we headed to the Waipoua Forest to meet Tane Mahuta. 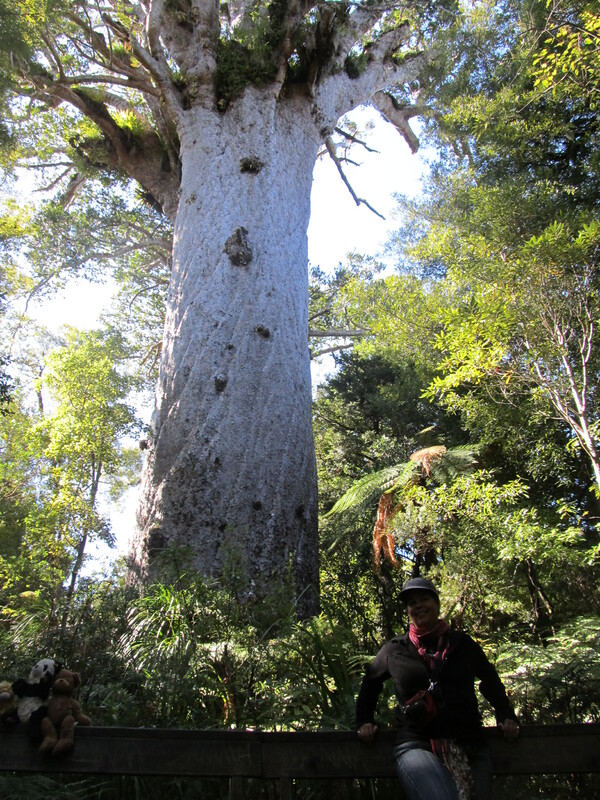 Tane Mahuta, or Lord of the Forest, is New Zealand’s largest known living Kauri tree. It is believed the tree was discovered around 1920. According to Maori Legend, Tane is the son of Ranginui, Sky Father, and Papatuanuku, Earth Mother. His parents embrace prevented light from reaching earth and it was Tane who tore them apart and clothed his mother in the forests of today. All living creatures are considered the children of Tane Mahuta, whi is estimated to be between 1250 and 2500 years old. Pulling in to Auckland mid afternoon we said cheers to our driver and the other folks we had met on the bus and basked in the glow of our Magical Journey… ok a little corny but it had to be said. 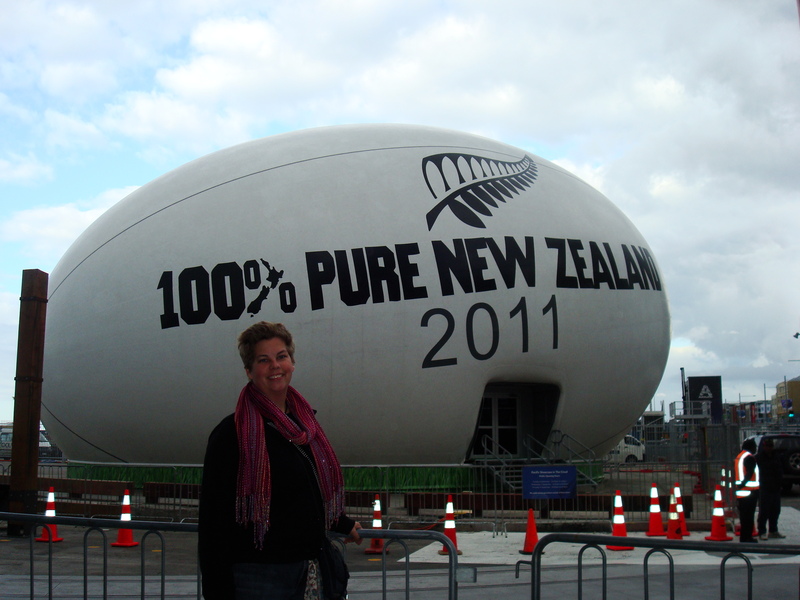 We decided to hang out, run some errands and take pics with some of the Rugby World Cup Landmarks. All too soon it was time to catch trains and busses and say farewell till next time. The other 3 were heading to the Coromundel for the weekend and then traveling South on Magic. 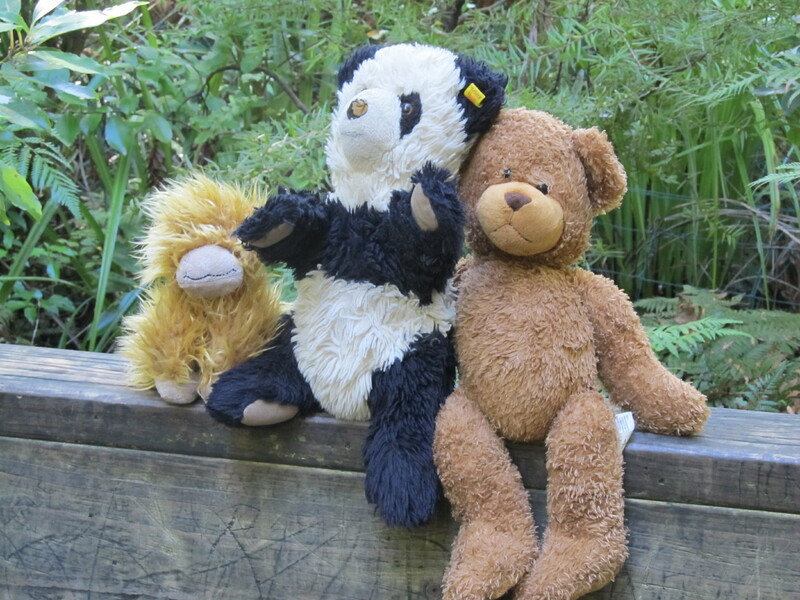 We planned to meet up in Wellington and continue our travels from there. All in all those 4 days were just what I needed and I truly thank Magic for making it possible. Today we have a free day from the tour. Due to the Magic Bus pick up schedule we can only be picked up on Tuesday. But that was fine with me as it gave a chill out day to explore this stunning town and take a walk in the sun to the Treaty Grounds. 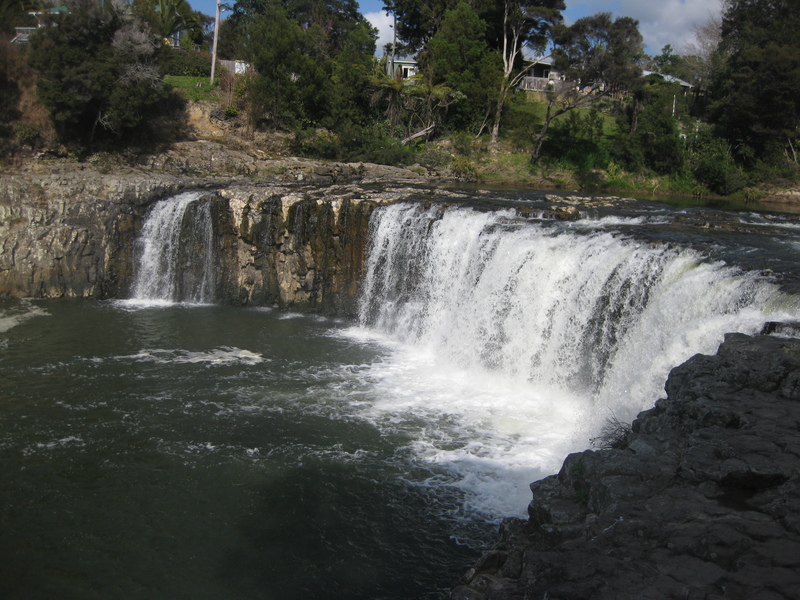 The girls, all skilled in bike riding, decided to borrow hostel bikes and head to the Haruru falls. 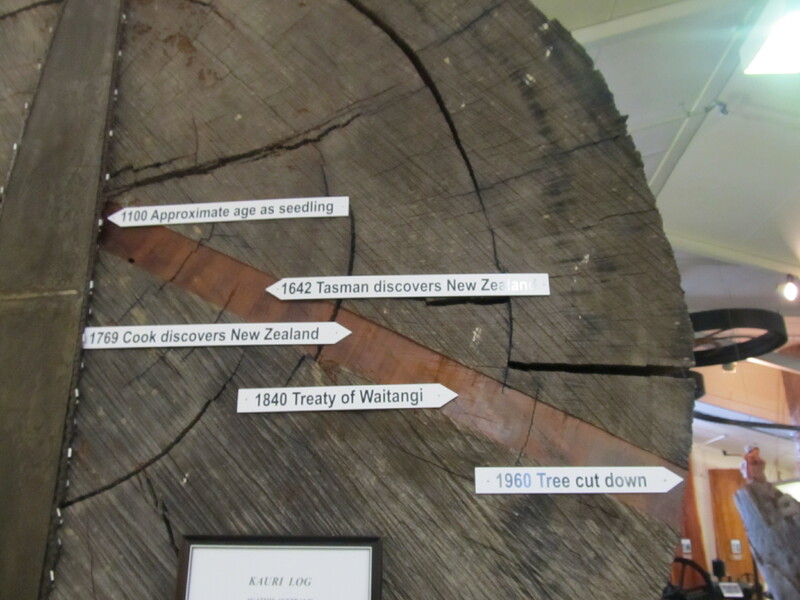 Me, being slightly less adept at the art of bicycles, opted to take a walk and use the free entry I had to learn about some important New Zealand history, the Waittangi Treaty. It was about a 2km walk from the hostel to the treaty grounds and all I had were my boots, and they were not hiking boots. But luckily they are wearable and only need new insole now and then. It felt great to walk along the waterfront, listening to music and contemplating…nothing. When I got to the Treaty Grounds I learnt that it was the Official Welcome for the Canadian Rugby Team. Bonus! But before they arrived I wandered around the treaty grounds and took in the beautiful forested areas. The Treaty was signed on 6th of February 1840 by the British Crown and various Maori Chiefs from the north island of New Zealand.It established a British Governor of New Zealand and recognised Maori ownership of land and gave them rights as British subjects. The treaty was written in both English and Maori… besides the fact that the Maori had no written language at the time, it was quite a remarkable event. The Treaty Grounds are set amongst beautiful native bush and right near the water. 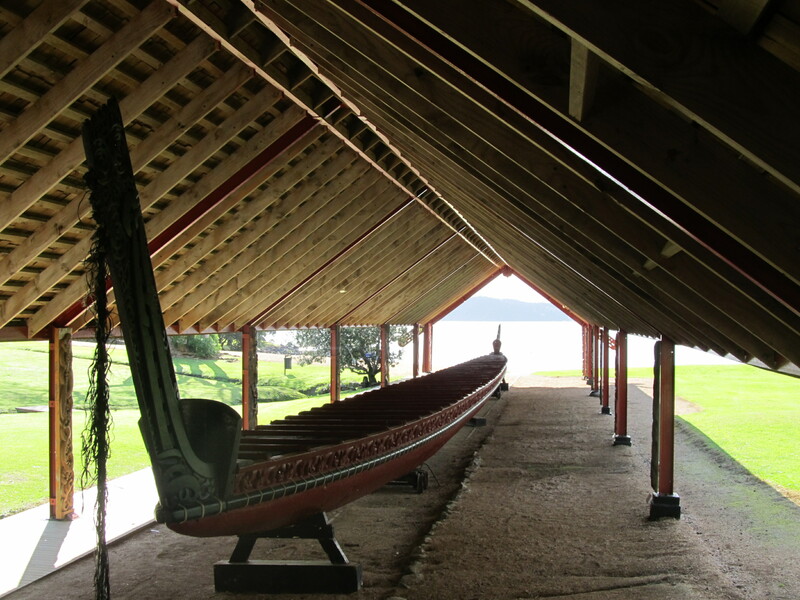 The ceremonial waka (canoe) is open to the public to walk around and see the stunning workmanship. 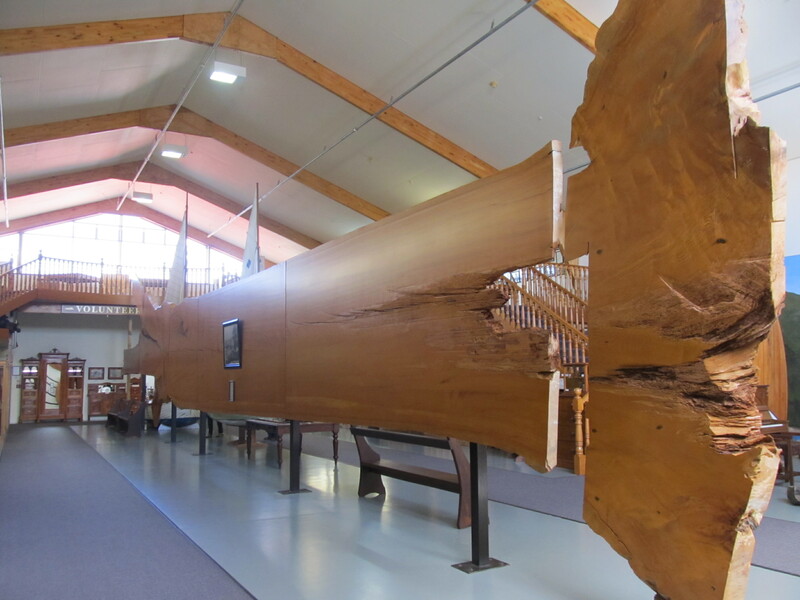 It was made out of 2 giant kauri trees. 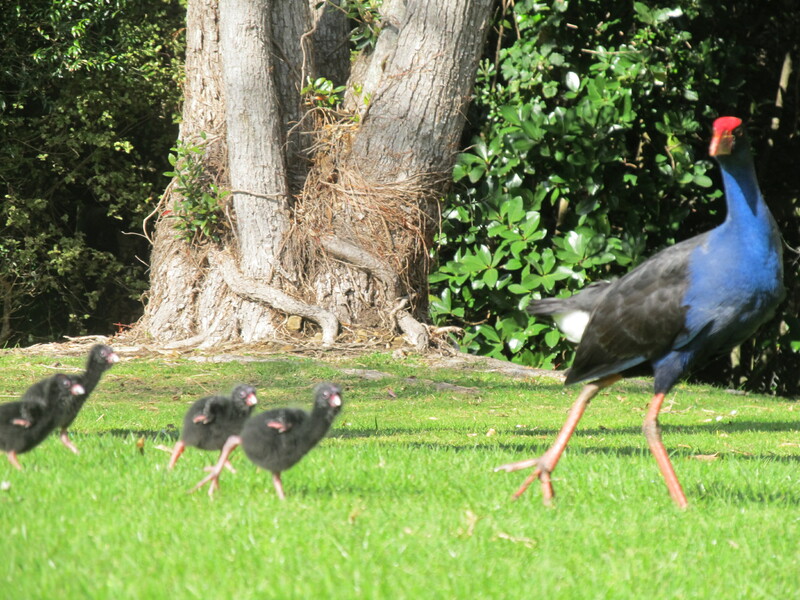 The area is home to numerous species of native birds and as it was spring, I came across a number of young ones. After exploring I headed over to the museum area where the Canadian Team would be welcomed. 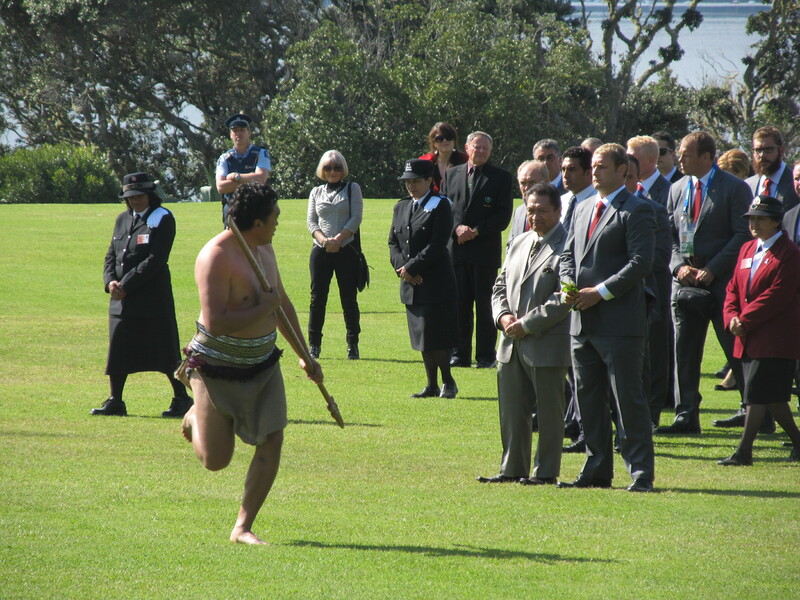 In traditional Maori fashion as the team walked up, there were numerous challenges by young men from different tribes. They would run up screaming, do an intimidating haka type dance and then lay some leaves on the ground. The team captain had to pick up the leaves and continue walking until confronted by another warrior. At the end the had to present the leaves to the chief and then were allowed entry. It was all very impressive and the young warriors did a fantastic job. After enjoying the cultural experience and listening to speeches I noticed the weather becoming a bit threatening so I decided to head out. On the way I stopped for a coffee and cake, just as the girls were cycling past, so they joined me. As we sat down it started to rain, good timing. But luckily it was a short storm and it had stopped by the time we headed out. Back at the hostel we made a great dinner and relaxed for the evening. 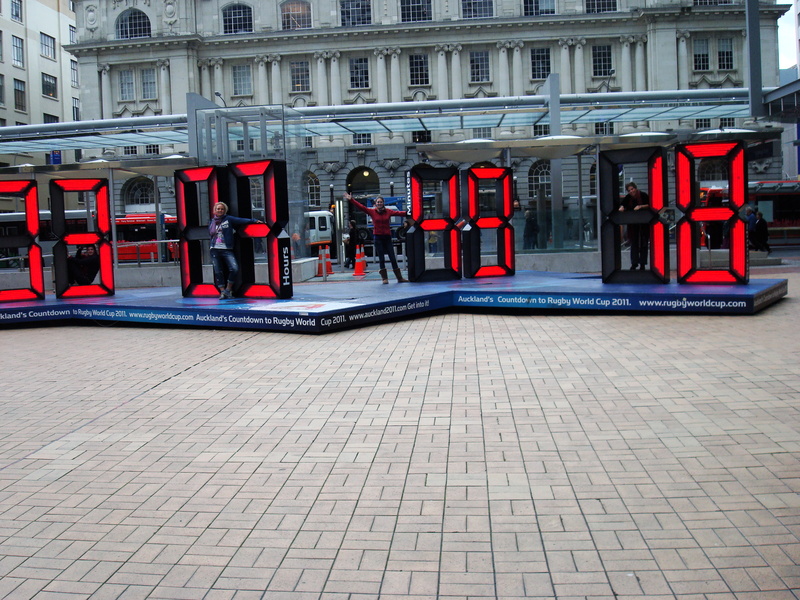 Tomorrow we head back to Auckland with a few interesting stops along the way with the Magic Bus. One of the great things of doing an all inclusive package with the Magic Bus is the fact that you don’t need to organise a thing! At 7am, only slightly hung over (somehow managed to down some ibuprofen and water at 1am in preparation), we were all picked up and driven along a scenic route through a land rich in culture and legend. 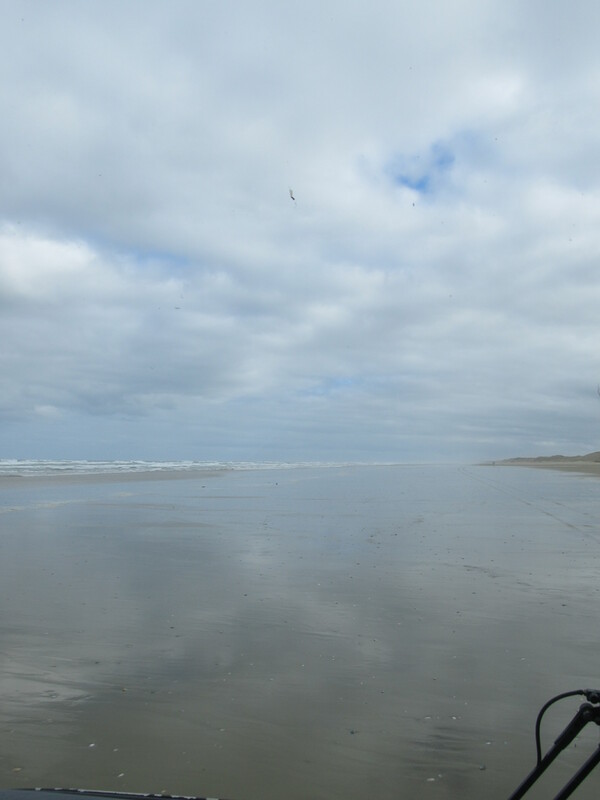 Due to the tide being high earlier in the day we had to change the regular schedule and head straight towards 90 mile beach. Technically speaking the beach was misnamed and is truly only 55miles. 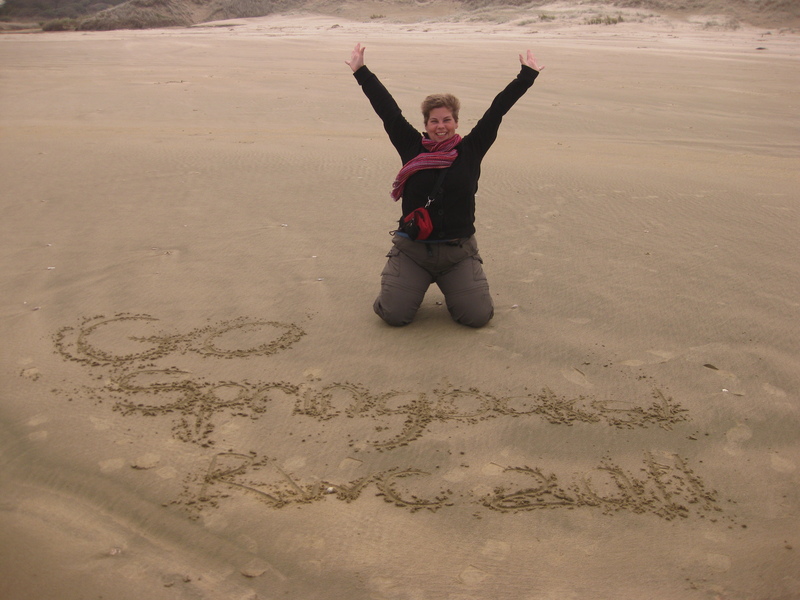 But 90mile beach has a much nicer ring to it and so the name has stuck. Driving along the beach swerving to avoid incoming waves, we headed to the sand dunes where we were to do some sandboarding, with a brief stop to enjoy this stunning section of beach. 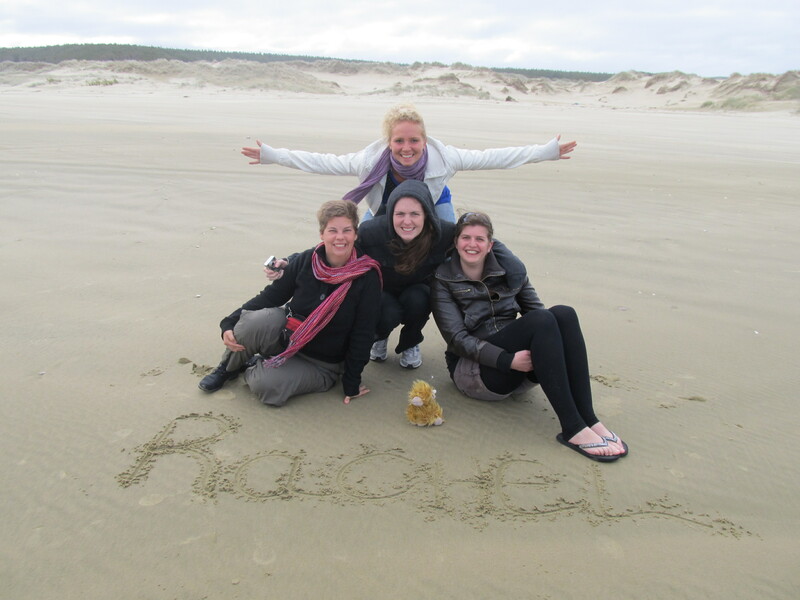 Good friends and Rachel the "hairy coo"
After exploring and running around on the beach we headed slightly inland to the dunes. 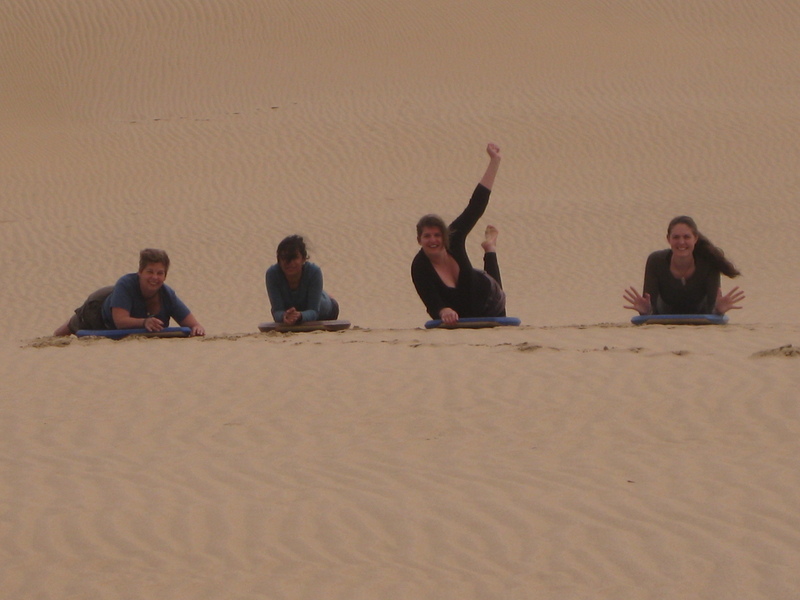 Sand boarding sounded like a blast and I couldn’t wait…until I saw the size and angle of the dune to boarded down. It was huge, massive, steep! And, I am sad to say, was struck by fear. I opted for a slightly less deadly dune while the others braved the monster taking their lives in their own hands. 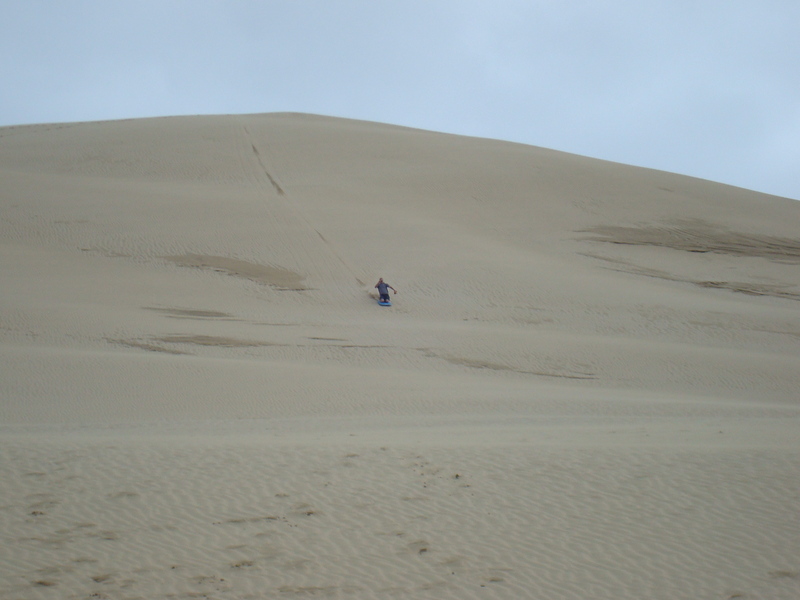 It didn’t help when our guide told us about a girl who had broken her leg, and how he had lost his bottom front teeth, all to the dune. For lunch we stopped at this stunning, secluded bay, that made you want to pitch a tent and stay for ever. The sun was shining, the breeze was cool and there wasn’t a cloud in the sky. While Jen (England), Freya (Scotland) and I were eating, Lissy (Germany) came over to the rest of us and asked if we had seen the seal. We quickly packed up and went to have look. The thing was massive! 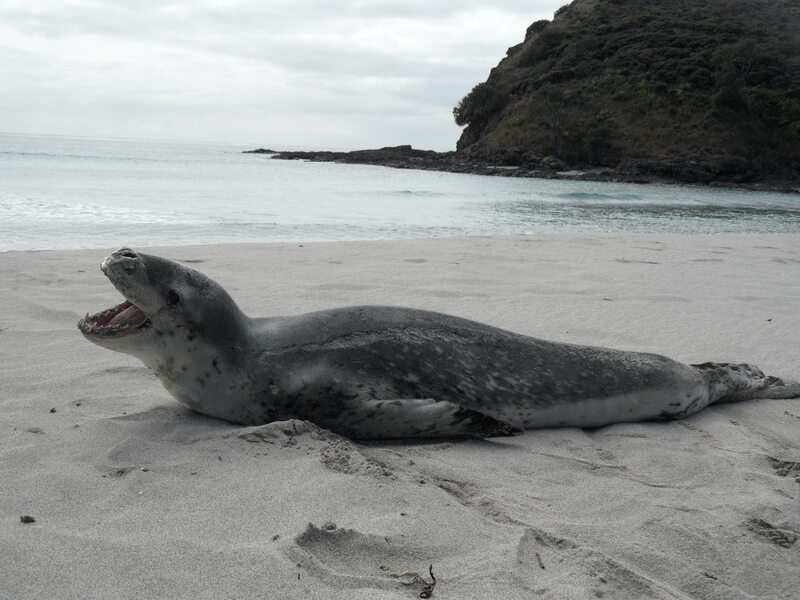 And the closer we got the more I realised it was a leopard seal, a sub-antarctic creature that was hundreds of miles away from home. The poor creature did not look very well and had even attempted to swim away but had returned to shore. It was either sick or overheated or both. Our driver said he would call the authorities but there wasn’t much to be done. 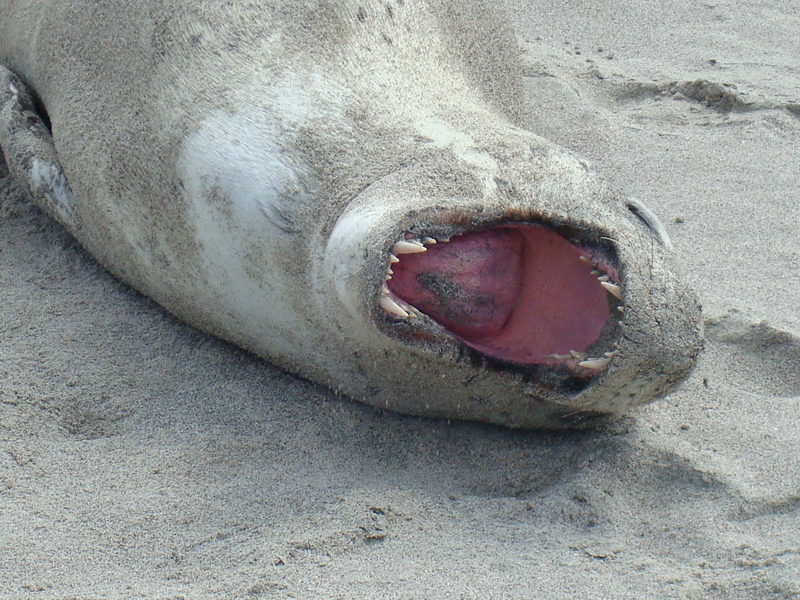 I never thought I would ever come face to face with a leopard seal in the wild. Goes to show you never know what you may see on the magic Tour. 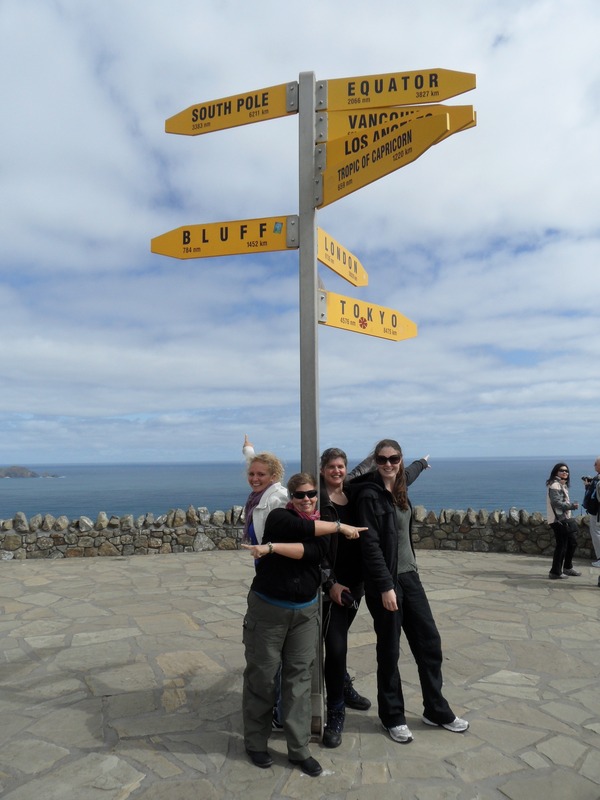 After getting our adrenalin rush we headed to the Northern most point of New Zealand, Cape Reinga. 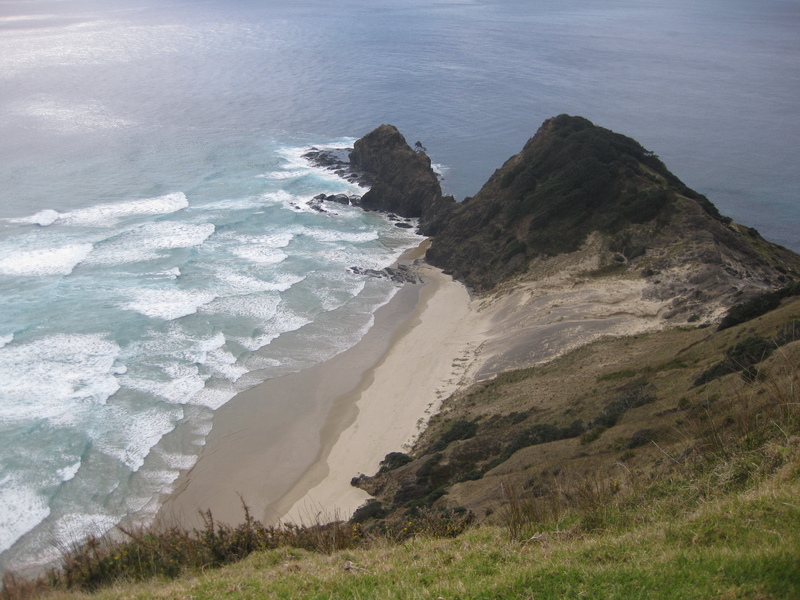 The Cape gets its name from Maori legend and the word Reinga means “underworld”. 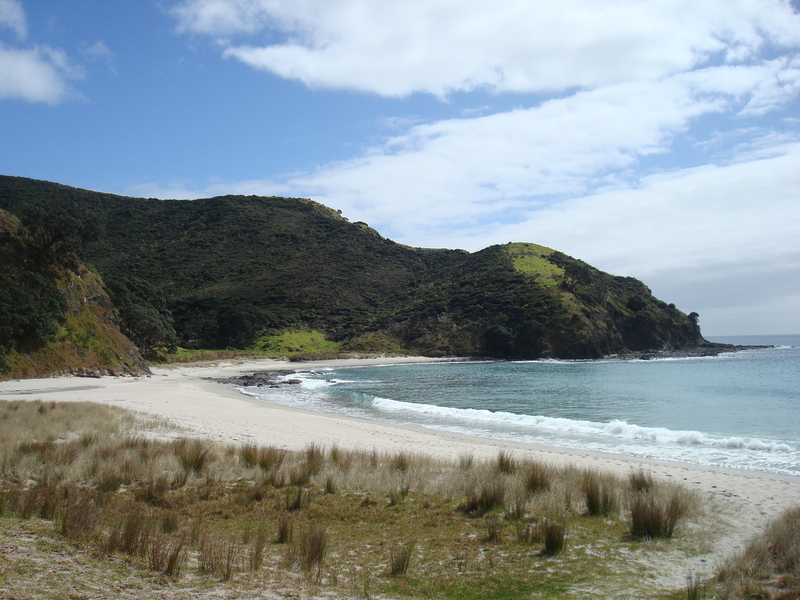 Another Maori name for the area is Te Rerenga Wairua, meaning the “leaping off place of the spirits”. Both of these names refer to the belief that the area is where spirits of the dead leap off and enter the underworld. The place is very Tapu, or restricted or forbidden. No food is allowed to the point and visitors are asked to be respectful. The area is unmistakably powerful and amazing and the views are tremendous. Its also where the two bodies of water meet, the Pacific Ocean and the Abel Tasman Sea. This is one trip everyone should make. 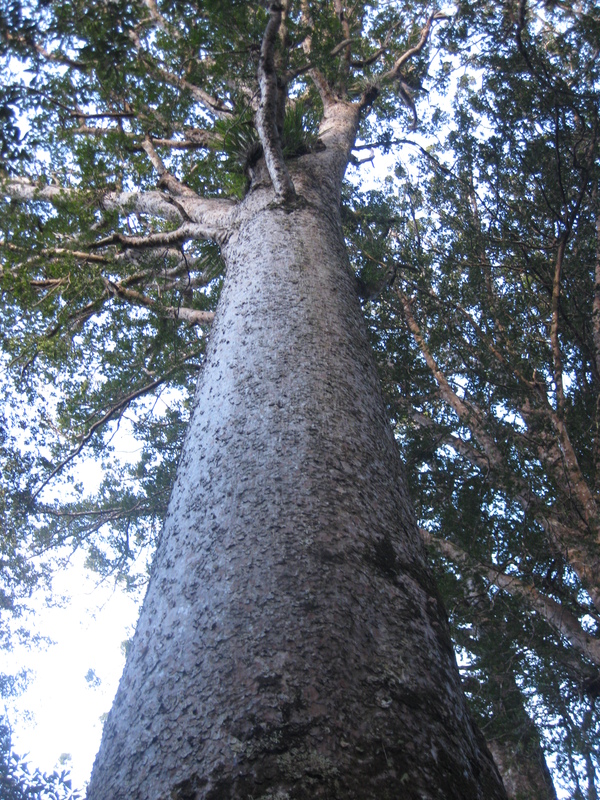 Kauri trees are native to New Zealand and were almost cleared out in earlier years due to their strength and beauty. The trees are also self limbing, meaning they drop lower limbs as they grow and therefore do not have knots in the wood like other trees. These trees are impressive to say the least and it is now illegal to cut them down. The only trees available for use are those blown down in storms or what is known as swamp kauris, trees that feel many years ago and have been buried in the swamps. The wood is still good though, preserved by the swamp itself. 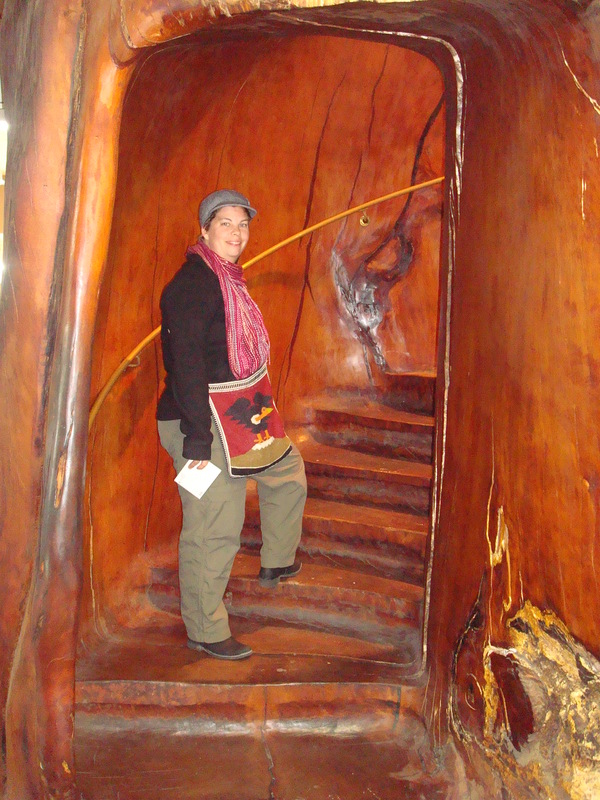 The museum was fascinating, but expensive, there was even a stairwell built out of an entire trunk. 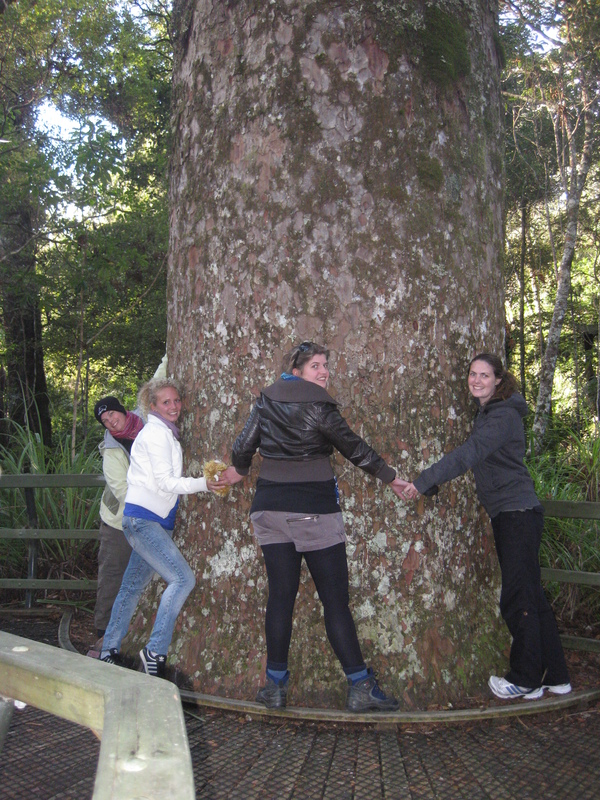 Our next stop was a kauri forest and man were the trees big. All I can do is show a photo. 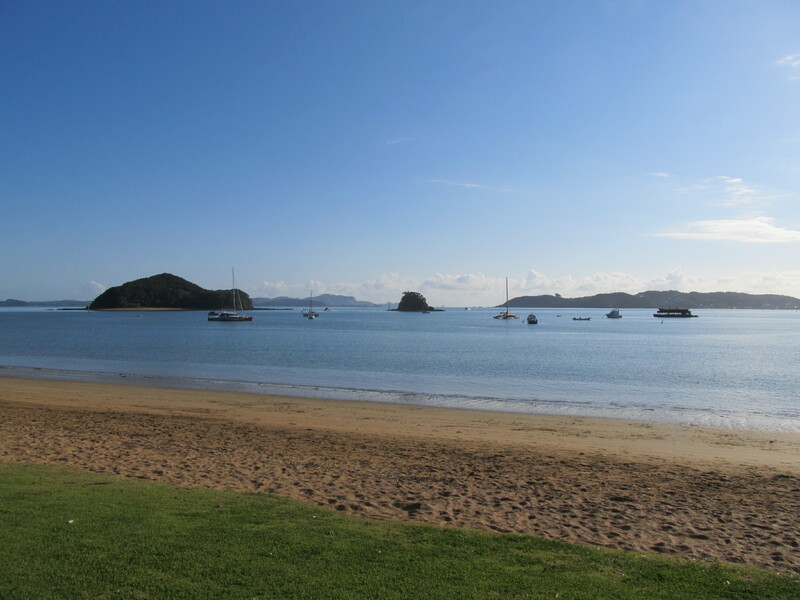 After a long day of touring and fun and discovering we headed back “home” to Paihia. It was a tremendous day and again I am thankful to have discovered the route on Magic Bus. After a dip in the hot tub and some dinner we curled up to watch number 2 and 3 of Lord of the Rings, after a further 6hrs…. we headed to bed. Tomorrow promises to be another fun filled day with the girls. Luckily the snoring in my room meant that my alarm did not wake the others, as it was a fairly early start. Despite the fact that the early morning is probably my most favorite time of the day, I really do not like getting up to enjoy it. 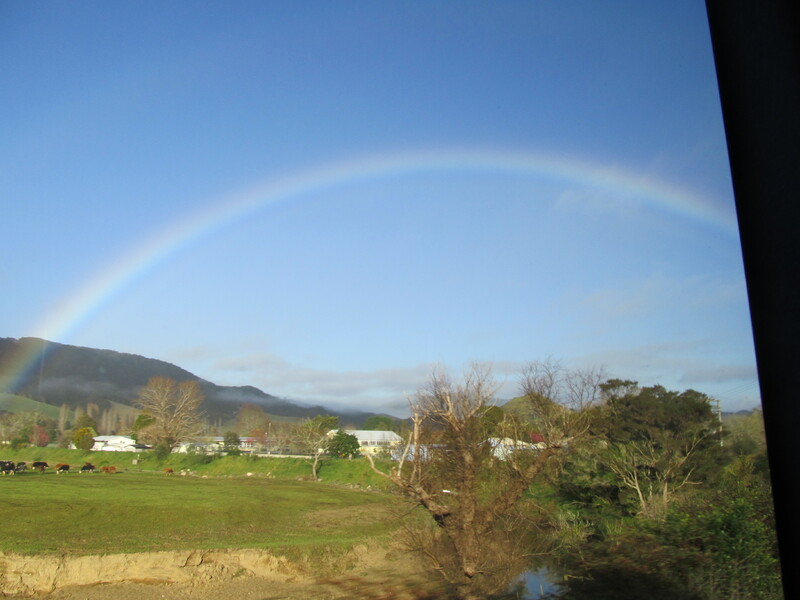 But when the reason is to start a 4 day tour to the North of New Zealand… well then, I am happy to drag myself out of bed and enjoy the morning. I arrived before the doors were even open at the Magic Bus, but it didn’t take long before I was ushered in and invited to use the free internet. Shortly after I was introduced to my driver, Kate. Then we were off to round up the troops at all the various hostels around town. We had around 14 people varying in nationality from Japanese, to German, to Indian, to Dutch, to Scottish, to English. A great mix of people and ages. 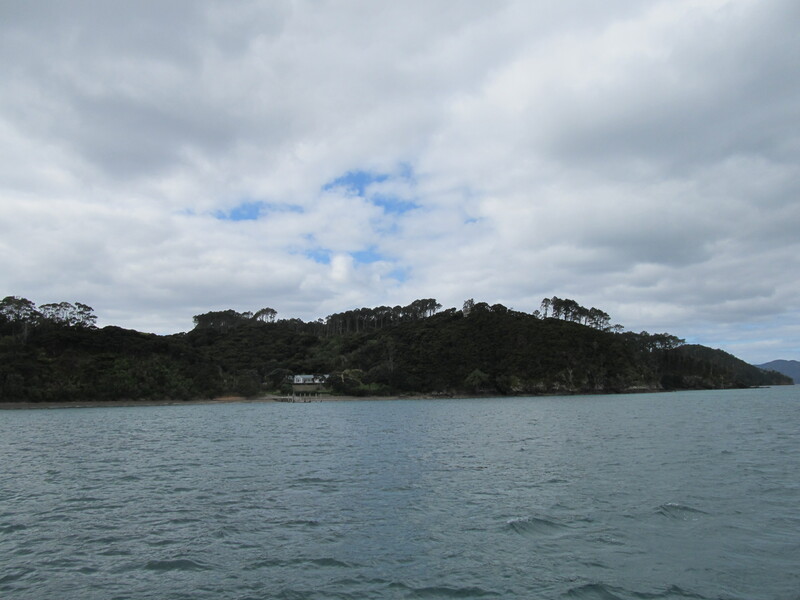 After heading out over the Auckland Harbor Bridge we headed straight North for the Bay of Islands, arriving in Paihia around noon. Kate gave us a bit of a drive by through town to give us the lay of the land and then dropped us off at our hostels. We had about an hour to kill before joining the “Hole in the Rock Dolphin Cruise”. I had decided on the all inclusive package, that way I did not have to think about anything or plan anything, I could just go with the flow and that was exactly my plan. Having been on quite a few dolphin cruises in my time, this would most likely have been an activity I would have skipped. But I am so glad that I didn’t. The cruise was fantastic and the views truly astounding. The boat doesn’t exactly cruise along like you might expect but actually speeds along at a decent pace, which is good considering the distance you cover. 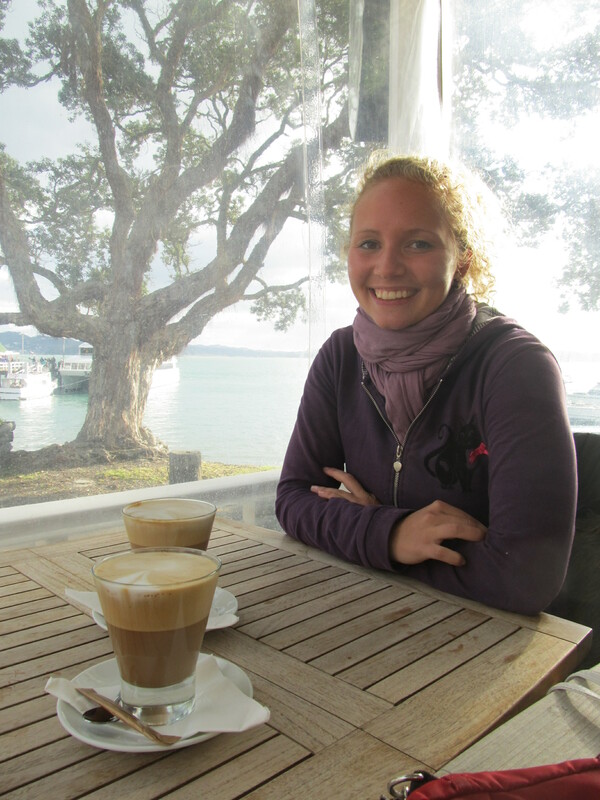 While waiting to get onboard I met Lissy from Germany. She was also on the Magic Tour and we hit it off immediately. Our first stop was to pop over to Russell Island, once known as the Hell Hole of the Pacific due to the hellacious actions of traders and ships’ crews. Today it has a more quaint, old English port feeling. 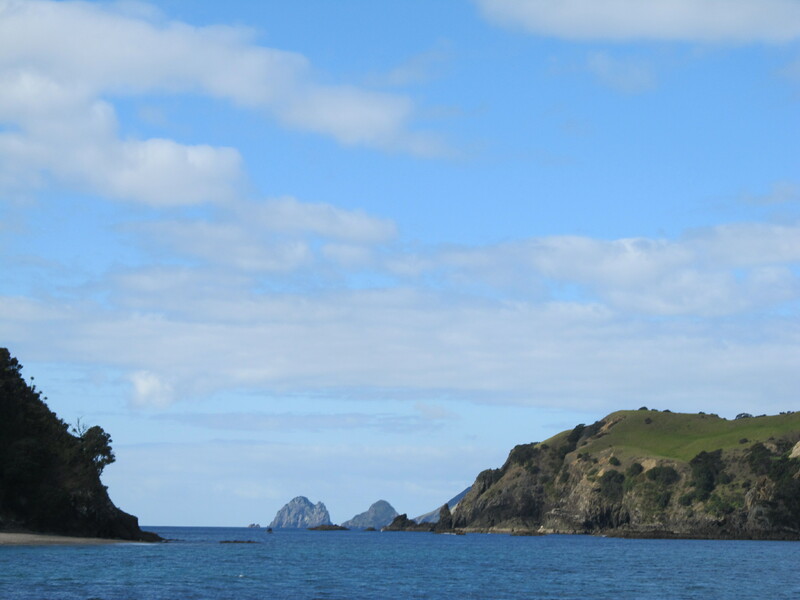 After picking up some passengers we headed out to explore the Bay of Islands. We were very lucky and came across a pod of dolphins within the first hour, they were very frisky and were playing, jumping and rubbing themselves against the rocks and sides of the boats. As there were no babies in the pod we were given the option to suit up and swim with them. But, as the weather was on the grey side and the water very cold, no one took them up on the offer. It had to have been one of the best dolphin viewing I had ever done. We dropped off the mail with the caretaker of a kiwi family’s private island, and explored small coves and fishing holes. We learnt about Captain Cook first meeting the local Maoris when they stormed him on mass as he stood with his crew on the beach of one of hte islands. His ingenious reaction was to quickly draw a line in the sand, the Maoris stopped and stood there, only getting aggressive when one of the crew stepped over the line to present a gift, they killed him in return. 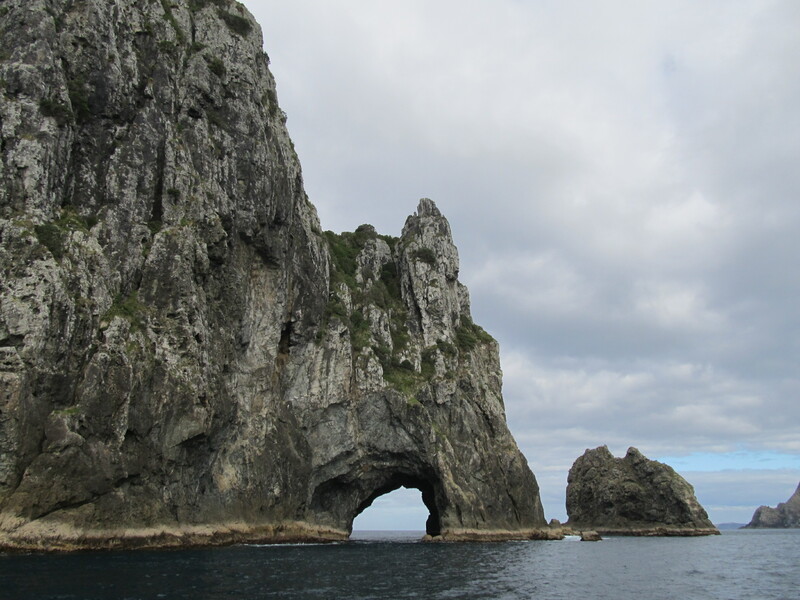 Then it was out into the open ocean to see the Hole in the Rock, which is precisely that, a hole in a large rock. It was spectacular and legend has it that if you go through it and a drop of water lands on your head then you will have luck and youth forever. So when the captain announced we were going to attempt it we all looked up and hoped to get blessed, to no avail. 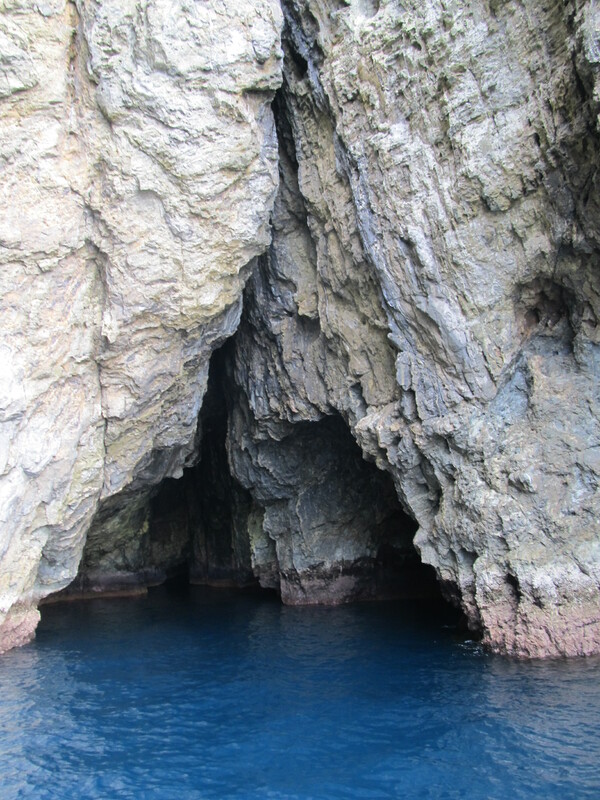 Our last stop was the Grand Cathedral Cave, which appears to be eroding into a hole as well, as divers have reported feeling a surge coming from the far side. The acoustics were incredible and the water appeared to be a glorious shade of green. Returning towards the mainland we came across another pod of dolphins. We had the option to get off at Russel with a free ferry ticket back or to just head back to the mainland. Lissy and I decided to spend an hour or two and explore Russel. The free ferry ticket might have been a selling factor… We walked all around the tiny town and finally settled in to have a coffee and enjoy some live music at the local hotel. It was a perfect afternoon and after an hour on Russel we decided to hop on the next ferry and go relax before dinner at 7pm. I had a dip in the hostel hot tub and walked across the parking lot to the next hostel where we were having the bbq. 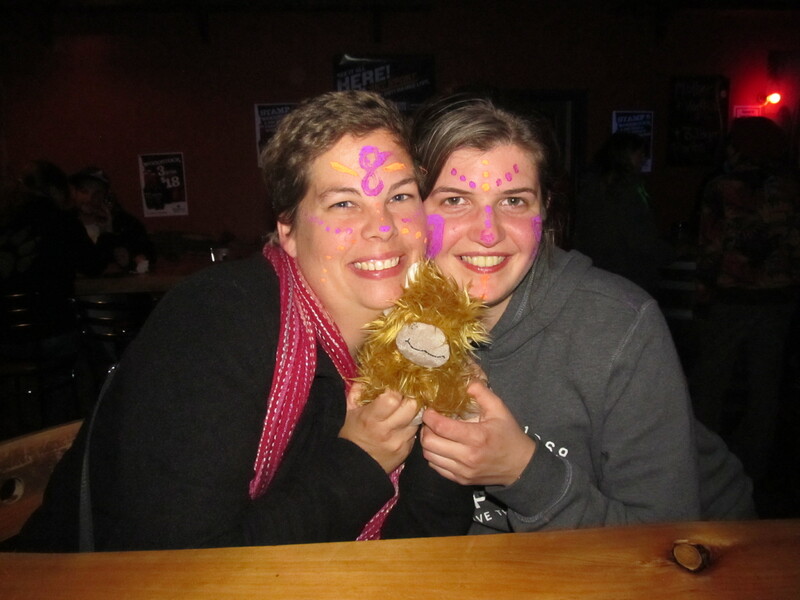 It turned out to be a great night and new friends were formed. Freya from Scotland and I had a fairly alcoholic night and I knew the morning would be rough when she started passing jaggerbombs around. The most amusing thing, other than the flourescent paint, was the Scotsman named Scott who was all hands. He first hit on Freya and when she extricated herself from him he immediately turned to me. After dancing a bit I ducked under his puckering lips saying I needed to find Freya. But fear not he turned around and found a new fancy without a second thought. Sometimes you need a good night out. A great day with Magic and an even epic night with great new friends! Arriving at 1am in the morning and being slightly less compus mentus, especially after having one of my full row seats given to someone else, the fear on my mind was getting through immigration. You may recall that I apparently have similar information, to a person of interest, who the government wishes to talk to! But turned out I had no worries, after joking a bit about the rugby, I walked on through, got my bag and hopped in a cab. I had exactly $45nz and had estimated it would cost $25. I had a great cab driver and we chatted all the way to Kirsten’s about his days on the boats that ran to Portland, Oregon. As we got closer I noticed we were at $45 and still ticking. In addition to the actual charge there is an extra $7 charge for the airport. At the house hte final charge was $52, but he was sweet and said the $45 was fine. Thank heavens! After a rough month it was great having a good friend to bounce ideas off of and figure out what to do next. Its amazing how emotionally draining things can be. I was at the point where I just needed to go and do something fun and not have to worry about costs or transport. 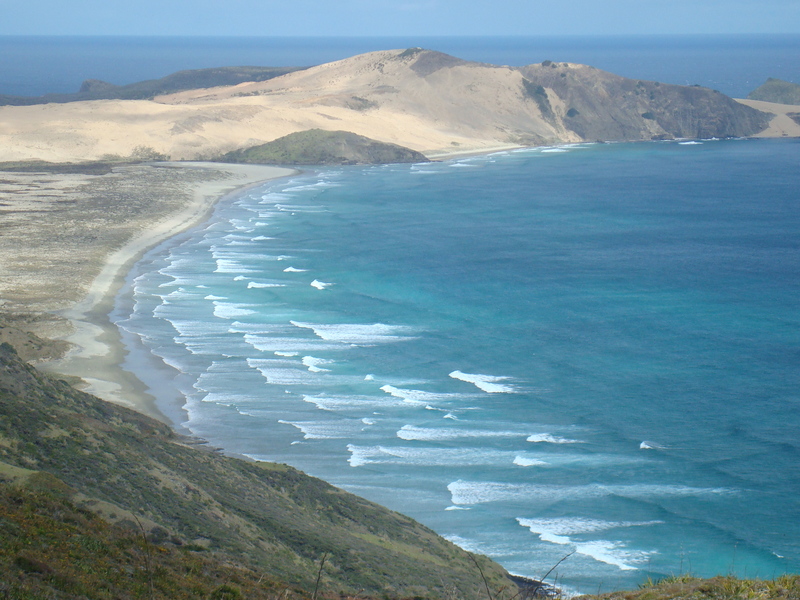 Kirsten recommended a tour of the Northland and up to the very point of NZ, Cape Reinga. 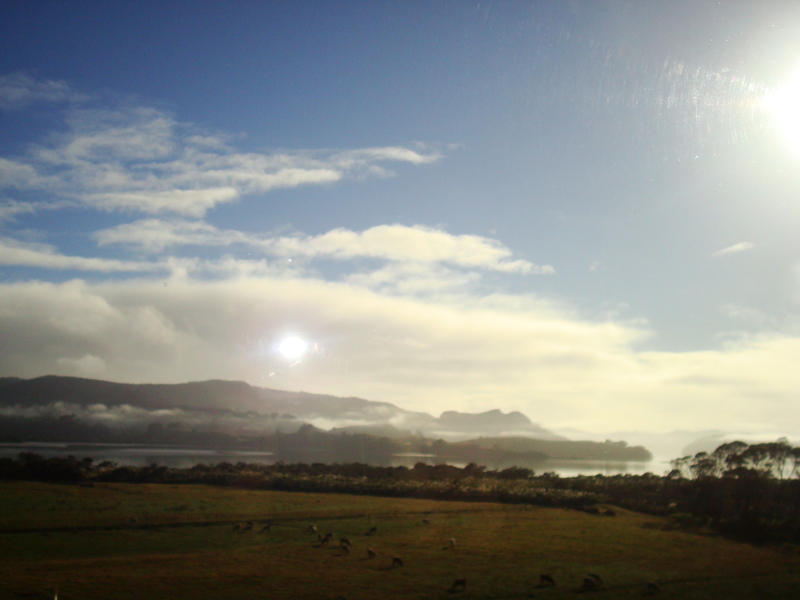 We looked at just doing a basic bus service up there, at Kiwi Experience and at Magic Bus. Magic won the day as they had exactly what I wanted and included a dolphin tour, sandboarding, Kauri tree museum, visiting the giant Kauris and much more. Normally I would have run in the opposite direction of the cost, but right then and there I didn’t care and it sounded like the perfect trip to get my mind off things. Not to mention that my cheapskate ways now mean that I have a bit extra to do something fun! So its off to Auckland to stay in the Surf ‘n Snow hostel for a night and then an early pickup Saturday morning. I am so looking forward to this you have no idea. Look out Northland you are about to be invaded by a Schmidt!! !